I am pleased to submit this testimonial statement of professional services on behalf of James A. Mendez, Attorney at Law and his staff members. 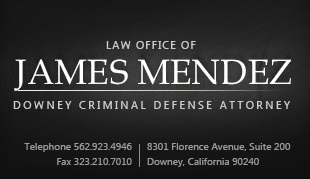 I have known Attorney Mendez since approximately 2007, when he took care of a family member case. The end result happened to be exactly as he predicted. Recently he represented another family member in court. I am very pleased with the outcome results. I consider my self honored to know him and to be able to count on his professional services.